Thurston’s surf winners on the podium. 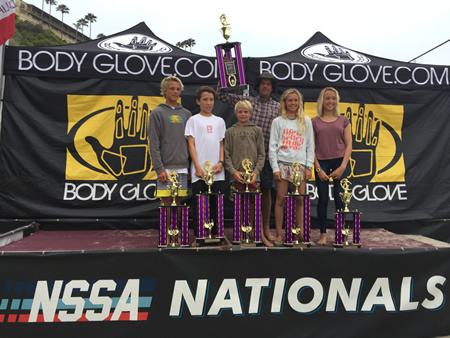 This past weekend, Thurston Middle School’s surf team took second place in the National Scholastic Surfing Association national championships at Salt Creek in Dana Point, which drew surfers from as far away as Hawaii. Five Thurston surfers made finals. Boys shortboard finalists included second place finisher Nolan Rodgers and fifth place finisher Jonah Clark. For girls shortboard, Kayla Coscino finished second and Kelly Smith sixth. Jameson Roller finished third in longboard. The team is coached by Bobby Lockhart and Jeff Booth.